Not just any local politician could have snagged Gov. Charlie Crist as keynote speaker for an annual Martin Luther King Jr. breakfast two years ago in West Palm Beach. Neither of them likely anticipated that two years later, Gov. Crist would be appointing then-state Rep. Priscilla Taylor to fill the District 7 vacancy on the Palm Beach County Commission. Former Florida state representative Priscilla Taylor, at the annual Martin Luther King, Jr. Breakfast in West Palm Beach two years ago, with Gov. Charlie Crist, who has appointed her to the Palm Beach County Commission. My latest in the South Florida Times. Not just any local politician could have snagged Gov. 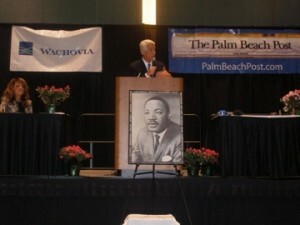 Charlie Crist as keynote speaker for an annual Martin Luther King Jr. breakfast two years ago in West Palm Beach. At the time, the new governor was in great demand for similar events in South Florida and around the state. Yet he was there, because then-state Rep. Priscilla Taylor invited him. It was another sign of her ability as a Democrat, an African American, and a woman — and his as a white male Republican — to work across party boundaries and other lines of division. Neither of them likely anticipated that two years later, Gov. Crist would be appointing Taylor to fill the District 7 vacancy on the Palm Beach County Commission. Taylor was sworn in July 13 after Commissioner Addie Greene resigned in April for health reasons. Despite the excellent working relationship that Taylor and the governor share, there was obvious sentiment for Crist to appoint a member of his own party. Also among the 24 applicants living in the district were Riviera Beach Councilwoman Billie Brooks, who was elected in March, and Elizabeth Wade, a former Riviera Beach councilwoman. Both are Republican and African-American. In announcing July 3 that the proven three-term legislator was best qualified to replace the county’s only African-American board member, Gov. Crist not only noted Taylor’s statewide experience. He also cited her experience as a businesswoman who owns an insurance agency. He recognized her six years of service as a Port of Palm Beach commissioner, including as chair, before she was elected to the Florida House of Representatives in 2004, and was reelected in 2006 and 2008. Also, he cited her service on numerous local boards. Taylor, 59, was born and raised in Fort Pierce. She earned a bachelor’s degree at Barry University and an MBA at Palm Beach Atlantic University. In Tallahassee, she served as Democratic whip from 2004 to 2006, and was respected as hardworking and effective in the Republican-dominated Legislature. In her state House District 84 seat that stretches from Riviera Beach to the Glades, Taylor already represented many of her Palm Beach County Commission District 7 constituents, who live in areas stretching from Lake Park to Delray Beach. Supporters in the community say that in appointing her to the commission, the governor was doing the right thing. She cited issues ranging from health to public transportation. She added that, “Being from the business community I didn’t see party. I saw people as people. If you have a good idea, let’s look at it. I believe in relationship building. It’s why I have gotten as far as I have. Tabernacle in West Palm Beach to investigate county zoning objections to the church sheltering the homeless. She was a staunch advocate for juvenile justice and the restoration of felons’ rights. Taylor said she probably received more letters from Republicans lamenting her leaving the Legislature than from Democrats. Nevertheless, Crist made her wait — and wait — for his choice to be announced to a board still recovering from having three commissioners since 2006 — Tony Masilotti, Warren Newell and Mary McCarty — resign and go to prison on federal corruption charges. The delay had left “a void” for District 7, Taylor said. Last month, she upped the ante, announcing she would forego reelection to her state post and run for the Palm Beach County Commission District 7 seat in 2010. Already lining up for the Aug. 25 special election to fill her unexpired term are West Palm Beach business consultant and former District 84 representative James Henry “Hank” Harper Jr., Delray Beach Commissioner Mackenson “Mack” Bernard and Riviera Beach Councilman Cedrick Thomas. All are Democrats. If no Republicans qualify by the July 28 deadline, a Democrat again would be elected in the Democrat-leaning district in which black people comprise roughly half the voters. That new representative could find that Taylor has not had a chance to move out of her Capitol, Belle Glade or Riviera legislative offices. Upon being sworn in, she immediately had to consider major issues that her commission colleagues had been contemplating for weeks, including drastic cuts in the county’s $4 billion spending plan and a proposed 15 percent property tax rate increase. But the work is in caring hands, Bush said. C.B. Hanif is a former news ombudsman and editorial columnist for The Palm Beach Post who also blogs at www.cbhanif.com. Great article – lots of interesting info!